Nevisense is the first diagnostic support tool to utilise Electrical Impedance Spectroscopy (EIS), an innovative method that provides objective information drawn from atypical lesions. The Nevisense method is safe and painless, and its accuracy is clinically verified in the world's largest prospective study ever conducted in the detection of malignant melanoma. By providing valuable diagnostic information that is unavailable through any other technique, it allows physicians to make more informed decisions in difficult or borderline cases. Until now, the only methods for clinical diagnosis of malignant melanoma have been visual. For advanced melanomas and truly benign lesions, these are procedures that most dermatologists confidently rely on. But for early-stage melanomas and other non-typical lesions, visual examination may be a greater challenge. In order to reduce the risk of missing a melanoma, many benign lesions are therefore unnecessarily excised. While at the same time, the risk of missed melanomas still remains. In these challenging cases, an additional source of information can help physicians to both improve patient treatment and save lives. Nevisense is the first diagnostic support tool to utilise Electrical Impedance Spectroscopy (EIS), an innovative method that provides objective information drawn from non-typical lesions. By measuring and analysing lesions, Nevisense detects structural changes in the tissue such as cellular orientation, cell sizes and cell types, which gives physicians a valuable source of additional, complementary information for melanoma detection. With Nevisense, SciBase has developed an innovative method for improving accuracy in the detection of malignant melanoma. 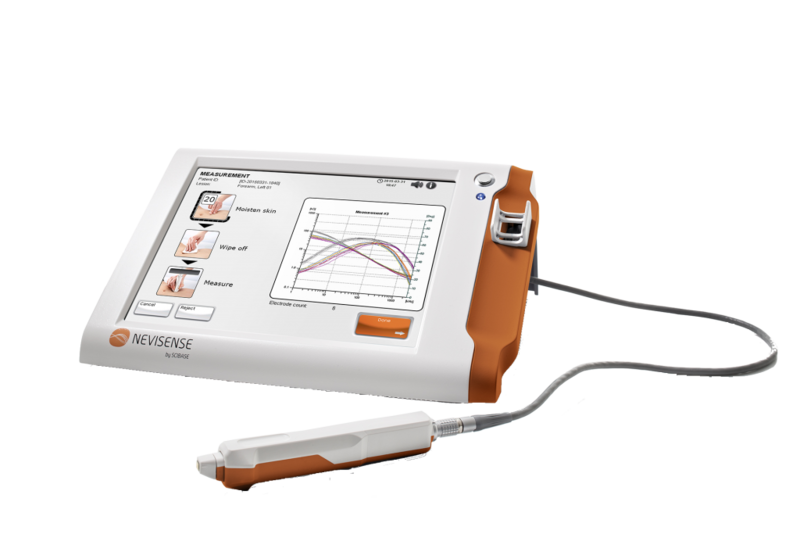 Utilising Electrical Impedance Spectroscopy (EIS), applied as a harmless electrical signal to the skin, Nevisense is able to provide a reliable, objective analysis of suspicious lesions which complements the physician’s regular clinical evaluations. The Nevisense method is both safe and painless. By providing valuable diagnostic information that is unavailable through other methods, it allows physicians to make more informed decisions in difficult or borderline cases. Nevisense, used as a diagnostic support tool, makes it possible to increase diagnostic accuracy, leading to both early detection of malignant melanoma and a reduction in unnecessary biopsies. Measure what can't be seen. Diagnostic support tool utilizing Electrical Impedance Spectroscopy (EIS), an innovative method providing objective information drawn from atypical lesions. By measuring and analyzing lesions, Nevisense detects changes in cellular structure, cellular orientation, cell sizes and cell types and gives additional and complementary information for melanoma detection. Nevisense is intended for use on cutaneous lesions with one or more clinical or historical characteristics of melanoma. It is designed to be used when a physician chooses to obtain additional information when considering excision. Nevisense should not be used to confirm a clinical diagnosis of melanoma and it is only for use by physicians trained in the clinical diagnosis of skin cancer. The Nevisense result is one element of the overall clinical assessment and the output should be used in combination with clinical and historical signs of melanoma to obtain additional information prior to a decision to excise. Nevisense is indicated only for use on primary skin lesions with a diameter between 2 mm and 20 mm; lesions that are accessible by the Nevisense probe; lesions where the skin is intact (i.e. non-ulcerated or non-bleeding lesions); lesions that do not contain a scar or fibrosis consistent with previous trauma; lesions not located in areas of psoriasis, eczema, acute sunburn or similar skin conditions, lesions not in hair-covered areas, lesions which do not contain foreign matter; and, lesions not on special anatomic sites (i.e. not for use on acral skin, genitalia, eyes, mucosal areas).